The Fabricast FIG 61 is a unique high performance knife gate valve design utilizing dual replaceable polymer seals. Designed and tested to MSS SP81 and ASME B16.5 specifications. Dual Polymer seals (Teflon is Standard) fitted on 316 Stainless Steel retaining rings along with robust o-rings (EPDM Is Standard 300 Deg F.) that provides resiliency and seal loading. 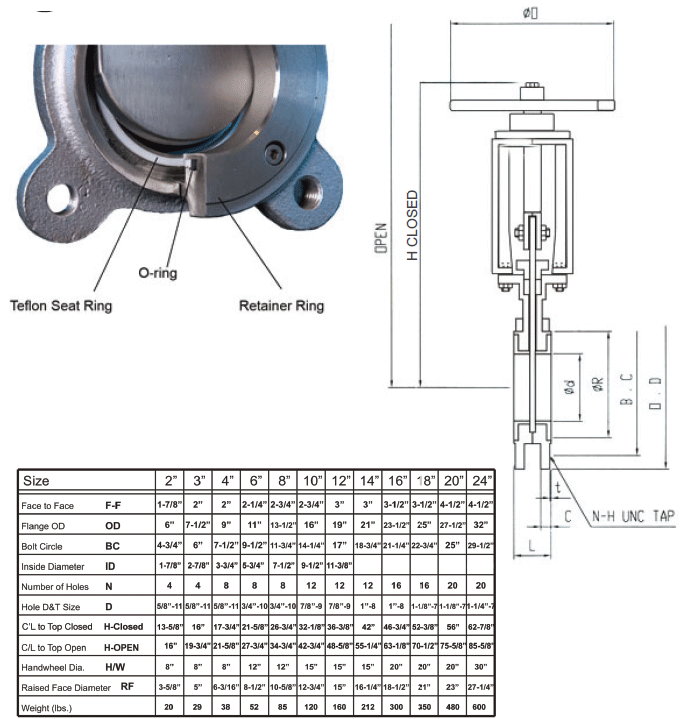 The o-rings also seal the machined retainer ring cavity in the valve body to eliminate external leakage. Seals, o-rings and retainer rings are easily replaced either in the shop or in the field. Heavy Duty Cast CF8M 316 Stainless Steel Body and Packing Gland. Valve body, retaining rings, stem and Polymer seals are precision CNC machined. ASTM A240 316 Stainless Steel gate fully machined and surface ground to provide a smooth sealing surface for the seals. All edges are chamfered to extend packing life and provide a superior packing seal. Heavy Duty Cast CF8 304 Stainless Steel Yoke, Stemnut Retainer and Stem Clevis. 14″ and larger valves are provided with a ball bearing yoke bushing to reduce handwheel rimpull. Cast WCB Steel Handwheel (weldable).